Blow up a balloon the fun way! 1. Pour a little vinegar into a plastic bottle. Choose a plastic water bottle, or another bottle with a narrow neck. Pour 1–2 inches (2.5–5 cm) of vinegar into the bottle, using a funnel if you have one. Use white vinegar, also called distilled vinegar, for the best result. 2. 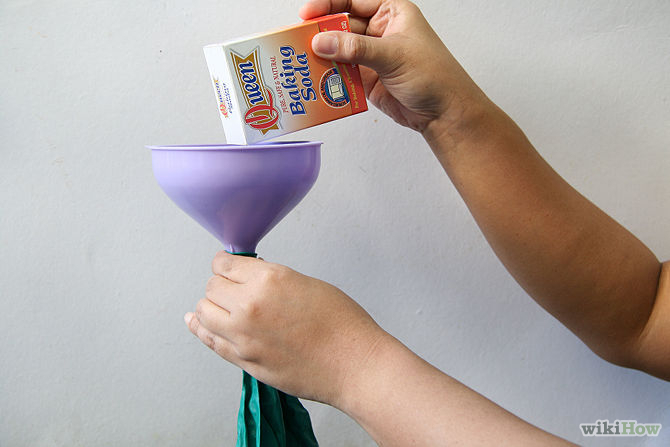 Use a funnel or straw to put a little baking soda into a limp balloon. You can use any shape and color of balloon. Hold it loosely by the neck, with the open side of the balloon facing towards you. Fit a funnel into the neck if you have one, then pour about two tablespoons (30 mL) baking soda into the balloon, or just fill the balloon about halfway full. 3. Stretch the neck of the balloon over the top of the bottle. Be careful not to spill the baking soda while you do this. Hold the balloon’s neck with both hands and stretch it over the top of the plastic bottle containing vinegar. Have a friend keep the bottle steady if the table or bottle is wobbly. 4. Lift the balloon up over the bottle and watch the reaction. The baking soda should fall out of the balloon, through the neck of the bottle, and into the vinegar at the bottom. Here, the two chemicals will fizz and react, turning into other chemicals. One of these is carbon dioxide, a gas, which will rise up and inflate the balloon. Shake the bottle gently to mix the two ingredients if there’s not much fizzing. 5. If it doesn’t work, try again with more vinegar or baking soda. If the fizzing has stopped and the balloon still hasn’t inflated after you count to 100, empty out the bottle and try again with more vinegar and baking soda. The stuff left in the bottle has turned into other chemicals, mostly water, so it can’t be used again. Don’t go overboard. The bottle should never be more than about 1/3 full of vinegar. Understand chemical reactions. Just about everything around you is made up of molecules, or different types of substances. Often, two kinds of molecules react with each other, breaking up and forming different molecules out of the pieces. JM Cremps carries a complete line of fun and exciting at-home science experiments for kids. They carry science kits and science experiments for every age. The My First Super Science Kit is perfect for the younger scientists. As your scientist gets older and more knowledgeable, our Chemistry Kits, Snap Circuits Snaptricity Kits, and our Build Your Own Combustion Engine Kit are a few of our favorites.